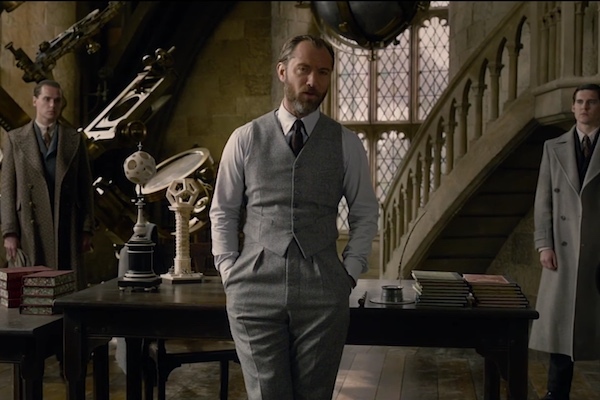 Jude Law, who will portray a young Albus Dumbledore in the upcoming “Fantastic Beasts: The Crimes of Grindelwald,” defended the controversial decision to not make Dumbledore “explicitly” gay in the film. In 2007, Rowling revealed that Dumbledore is gay and had romantic feelings for his friend Grindelwald when he was younger. As the “Fantastic Beasts” series includes a young Dumbledore and Grindelwald some fans were excited to see gay representation in the film. However, director David Yates shared that Dumbledore’s sexuality would not be “explicitly” addressed. The announcement caused an outcry in the fandom. Law, 45, told Entertainment Weekly that he asked author J.K. Rowling about Dumbledore’s sexuality. “I suppose the question is: How is Dumbledore’s sexuality depicted in this film? What you got to remember this is only the second ‘Fantastic Beasts’ film in a series and what’s brilliant about Jo’s writing is how she reveals her characters, peels them to the heart over time. You’re just getting to know Albus in this film, and there’s obviously a lot more to come,” Law continued. “Fantastic Beasts 2” hits theaters on Nov. 16.